​March 9-10, 2018 • 7:30 p.m.
March 10-11 • 2:00 p.m.
Brief vignettes span the months from Valentine’s Day to Beethoven Day, from wild optimism to utter despair. In this revised version, with additional music and lyrics by Andrew Lippa and dialogue by Michael Mayer, the sweet, joyful innocence of the Peanuts gang is maintained, but a fresh insouciance and playfulness is revealed. The new script features two new songs, particularly funny dialogue, and new, catchy orchestrations. Whether you’re keen to fly with the Red Baron, moon over the Moonlight Sonata, or just do your best to find “Happiness,” You’re a Good Man, Charlie Brown is a must-see for all ages. 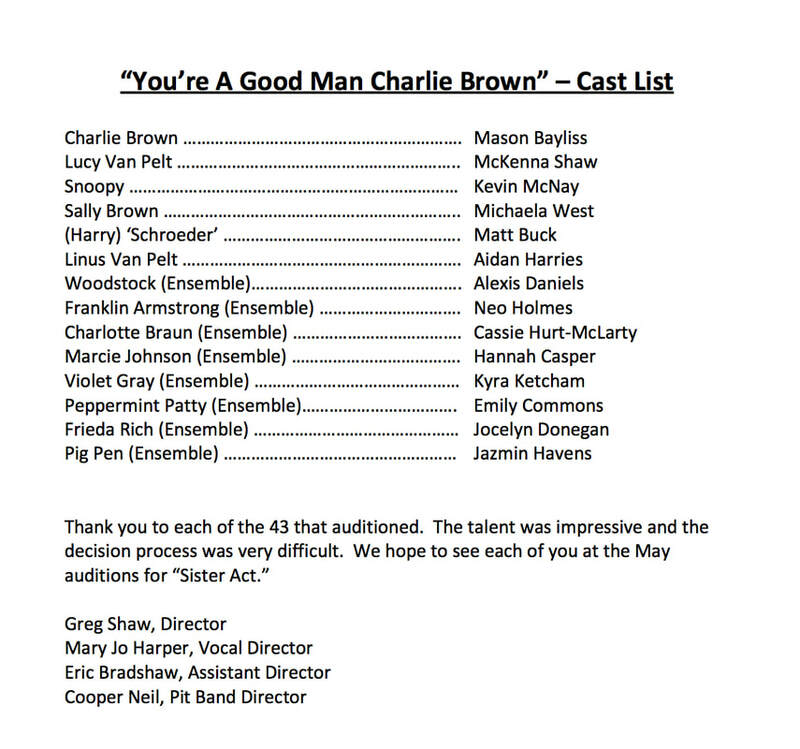 "Charlie Brown" will be directed by Greg Shaw, PCT board member and theatre teacher at Pittsburg High School. His recent credits include "Seussical" and "Urinetown" for PHS, and "13" and "Junie B. Jones" for PCT. His shows have won numerous Jester Awards through Music Theatre Wichita and have been invited to be performed at the Kansas State Thespian Festival. Shaw also is a frequent director for Theatre in the Park in Shawnee, Kansas. MJ Harper, a veteran PCT performer, is an elementary music teacher in Ft. Scott. She’s been on stage since she was a little girl and frequently performs with the American Opera Studio in Kansas City, sings in the FUMC Chancel Choir, plays violin with the Southeast Kansas Symphony Orchestra , and teaches private lessons in piano, voice, violin, and ukelele. She has served a vocal director for several PCT shows. Cooper Neil, PHS Director of Instrumental Music (marching band, wind ensemble, jazz band, and orchestra), also frequently directs pit bands for area musicals. He also performs with the SEK Symphony, directs the Pittsburg Presbyterian Ringers, and has his own band, The Pageant Boys. In 2016, he received a Jester Award for "Outstanding Orchestra/Pit Band" for "Shrek, The Musical," produced in collaboration with Greg Shaw and PHS Vocal Instructor Susan Laushman.